Early in the Shadow Throne Kickstarter, a backer asked if I had any fun stories about cards that didn’t make the cut. I’m finally getting around to it… four months after the Kickstarter finished. Better late than never, right? Between the initial conception for Shadow Throne and when it funded on Kickstarter, I worked on a year’s worth of prototypes. When I discussed the evolution of the graphic design, I discussed seven versions of the game, but that doesn’t cover every little tweak I made along the way. Needless to say, I experimented with a lot of cards and mechanics that didn’t make it. Today I’ll cover some of the most interesting ones, explaining what I was trying to do and why they didn’t make it. In early versions of the game, special rules didn’t just trigger when you flipped a card. Sometimes, they triggered before the you tallied power at the end of a battle. Sometimes, they triggered when a faction lost the battle. There were many different times a special ability could trigger, each with its own symbol. Unfortunately, when explaining the game, playtesters really started to lose focus when I got to the different special rules symbols. It was just a little too much to front-load new players with. Additionally, I wanted to keep commoners simple, which means no special rules. In the earliest versions, income was an “on flip” special rule, and consolation gold was an “on loss” rule. To make the commoners as simple as possible, I standardized these as base aspects of every card. Limiting triggers reduces which special rules are possible, but only a little. Most of the “on battle” special rules just became “on flip” and operate very similarly. And a couple of cards still have unusually timed special rules disguised as “on flip” rules. Peasants don’t care who wins. Tuning the Shadow Throne economy was very tricky. In the early days, no card gave more than one gold, so it took forever to save enough to pay for the expensive cards. 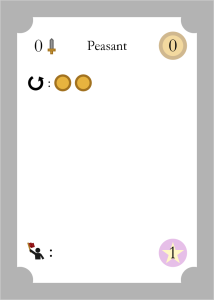 When I realized I needed cards with higher income, I tried something a little strange: I made neutral commoners not associated with any faction. In the end, the neutral characters joined factions for a couple of reasons. First, I discovered it’s important to make all cards contribute to a faction, since the power race adds a lot of suspense and excitement. Second, neutral cards added a surprising number of rule questions without contributing to gameplay. From the outset, Shadow Throne was designed to be 54 cards, but early on only 48 were characters. The remaining 6 were locations, representing the spoils of battles. It was a fun, thematic idea, and I tried many different versions, but I ultimately cut them. That’s a market worth fighting for. Locations did two things. 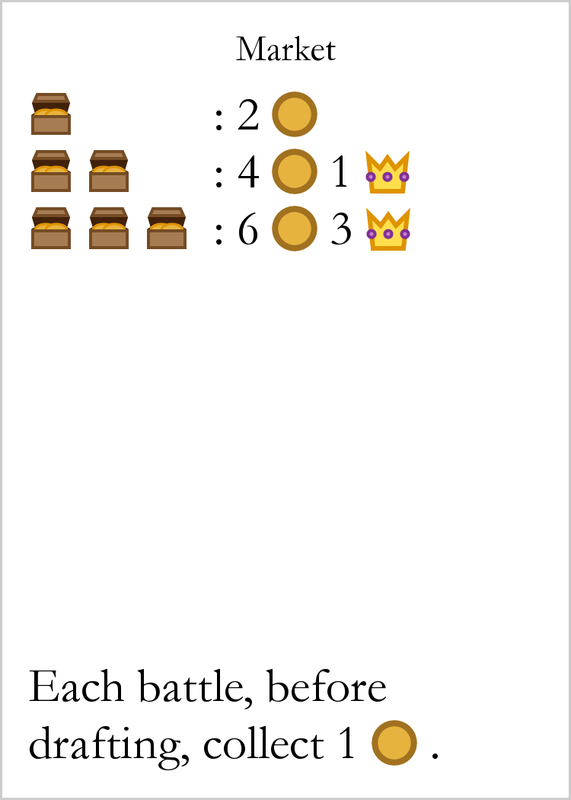 First, each location had a special rule, and the “winner” of a battle (the player who either earned the most influence or contributed the most power to the winning faction) gained the location. This added an extra reward for winning, but it was easy to forget and led to rich-get-richer scenarios. Games get less fun when early victories lead to later victories. I also struggled a lot with determining what locations should do–should they have repeated effects, like gain 1 gold every turn? Or should they have immediate effects, like collect 2 influence? I even experimented with hidden locations, which weren’t terribly thematic but were mechanically interesting. Second, locations determined rewards for certain characters. Early on, characters didn’t just grant influence when their faction won. 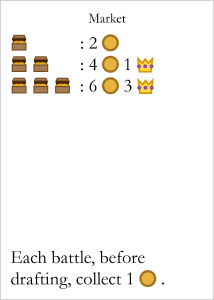 Some granted gold, while others granted “spoils” represented by treasure chests. Each location determined what those spoils actually meant. (For example, at the market, two chests are worth 4 gold and 1 influence.) While another fun idea, this didn’t work in practice for two reasons. First, the rewards weren’t fine grained enough to make meaningful and balanced differences between locations. Second, I quickly learned that players should never earn gold from winning a battle. This creates serious runaway leader problems. Locations are a great lesson in making thematic games. You probably learned about Shadow Throne without the locations. Did you feel like there was something missing? Probably not. Most players won’t notice omissions like this. Even though I know that the game is lacking something potentially cool, most people will never miss the locations. 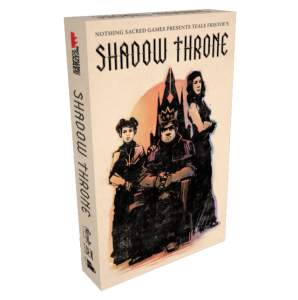 Shadow Throne has three ranks: commoners, elites, and nobles. But it wasn’t always this way. In the early prototypes, ranks were numbered rather than named, and there were five. In the end, the extra granularity didn’t improve gameplay. Plus, using names made a lot more sense than numbers. Three ranks led to a natural naming structure, plus it was easy to understand and still allowed enough play in the special rules. It’s like a total eclipse of the heart. 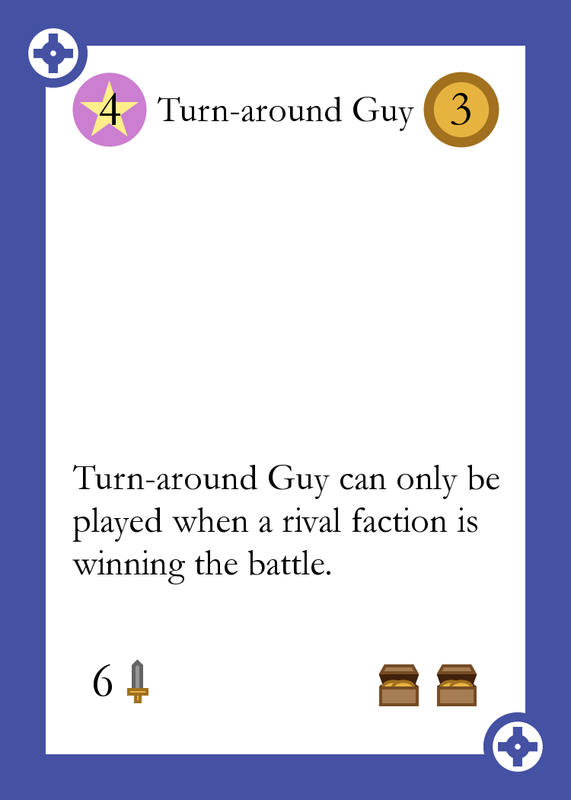 Our first specific card that didn’t make it is Turn-Around Guy, who embraced one of the big Rebel themes: start as the underdog but come back from behind. In the earliest implementation, Turn-Around Guy was powerful, but could only be played if the Rebels were losing the current battle. Sadly, as simple as that sounds, making the rule work technically proved to be very challenging. No matter how many versions I tried, I just couldn’t get Turn-Around Guy to work, so he was removed. Turn-Around Guy did inspire another card, though: the Church character Thavma the Revelator. Thavma cares about gold instead of power (which actually makes him play very differently), but the idea originated with Turn-Around Guy. Before they were the Queen’s Guard, one of the Rebel elites were known as Skirmishers with an “on loss” special ability: they would return to the player’s hand. This tied into the Rebel’s come from behind theme… if they lose this battle, they’re likely to return next battle. The rule didn’t survive because it was too subtle. Playtesters didn’t understand how it was beneficial. It just wasn’t worth the extra word count or confusion it caused. There’s room for subtlety in all games, but it should rarely appear as the defining quality of a single card. Of the three factions, the Empire changed the least from its initial conception. It was always all about killing. (What exactly killing did is another story…) The Empire card that went through the biggest changes was the Executioner, who later became Anna Lys. In the final version, this character kills all elites in the current wave, just like other Empire characters kill all commoners or nobles. 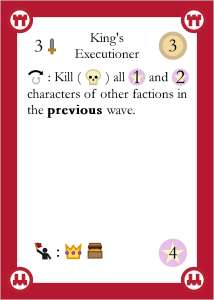 But in earlier iterations, the Executioner killed all commoners from the previous wave. Thematically, this was fun: it felt like punishment for past treason. Unfortunately, it didn’t play very well. Shadow Throne is a game about anticipation, where predicting your opponents gives you an advantage. Having a card that allows you to react a turn later dilutes that. Also, removing power from a previous wave proved to be more confusing than I expected. In the end, the Executioner followed the same pattern as the other Empire killers, which is good for the simple, baseline faction. Of the three factions, the Church was the hardest to pin down. The first version had no mechanical cohesion, and the mechanic that ended up defining the Church (conversion) actually started with the Rebels! While the faction as a whole went through major changes, I want to focus on one character, the Martyr (Simone the Sufferer in the final version). The martyr is a classic archetype that shows up in basically all religions and plays perfectly into the cynical nature of Shadow Throne, so I knew I wanted one from the very beginning. The trick was making it work mechanically. The original version had the Martyr very weak, so the card was bad unless it died. The problem is that getting the Martyr killed is difficult in the base game, and can even be impossible with some faction combinations from the expansion. 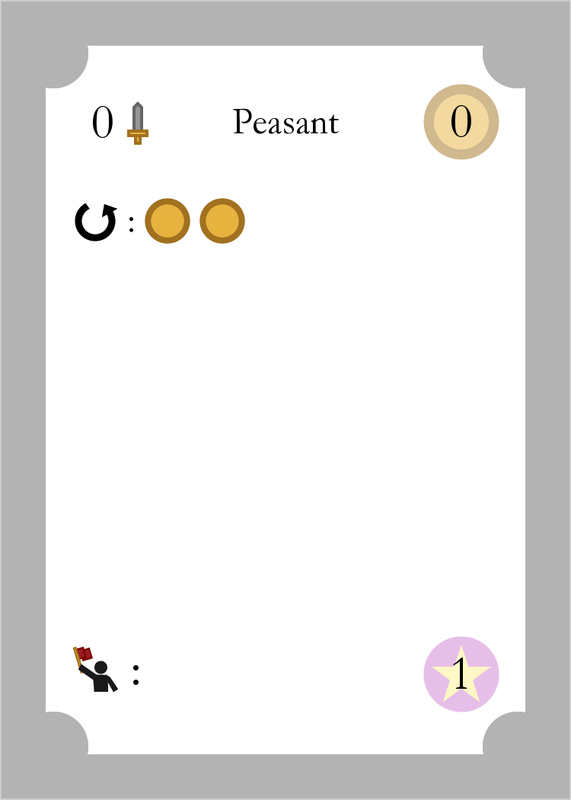 For the next version, I just added a special rule that grants victory points if the Church lost the battle. This taught me a very valuable lesson: victory points should never be guaranteed. In the end, the Martyr got the stats of a strong elite card, with the on death ability as a nice bonus. This makes her solid, if unexciting looking, even if you can’t put her in harm’s way. Whenever you’re working on a new game system, there are going to be rules and components that don’t make the final cut. While entertaining, I really hope these stories illustrate the importance of exploration and experimentation. Every card or mechanic here taught me very valuable lessons about Shadow Throne which not only helped guide the design of individual cards, but helped shape the whole game. They may not appear in the final box, but their influence lingers on in a smoother, more focused final play experience!